With the arrival of the most recent recruiting class and four star quarterback Ryan Hilinski, the quarterback position at South Carolina grew even more. With the addition of Hilinski QB’s further down the depth chart were given the option to switch to other positions. Former quarterbacks Jay Urich and Bailey Hart made the move to wide receiver this spring. Darius Douglas, who played a little wide receiver himself last spring, decided it was time to make a move. 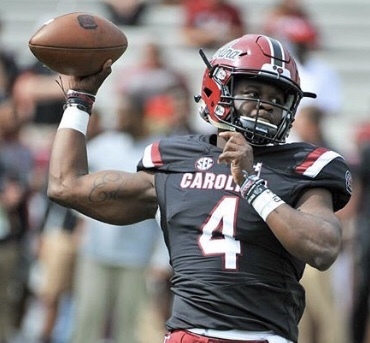 Darius Douglas has not had an opportunity to take any snaps as a Gamecock which is probably one of the big reasons he has decided to transfer. Darius was one of the most positive players on the team and would always be found dancing around. He had pretty much embraced his roll as a scout team QB. This spring he made the decision to transfer to another school. In his announcement he thanked Muschamp and the rest of the coaching staff for their support as he grew as both a football player, a student and a man. He also mentioned how thankful he was for the opportunity to learn from great players who helped him learn and become a better football player. We wish Darius Douglas the best of luck as he continues his career elsewhere. It will be interesting to see what school he ends up choosing. His positivity and energy will be missed in the quarterback room at South Carolina.